Carolina Panthers - NFL Laser Tag / Mirror License Plate. 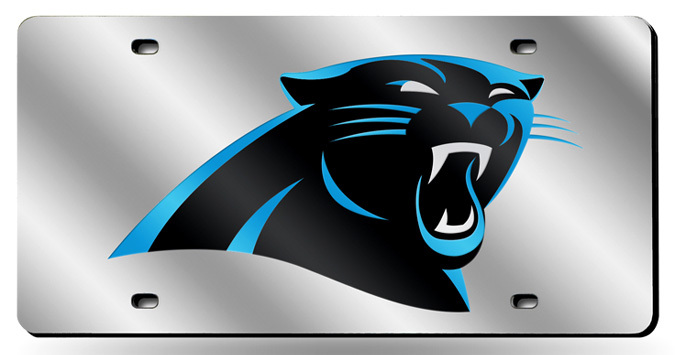 Officially licensed NFL 6" x 12" acrylic mirror license plate with Carolina Panthers team logo laser engraved in the center. Carolina Panthers Mini Helmet, Autographed and Inscribed by DeAngelo Williams, with Carolina Panthers Mini Helmet Display Case. 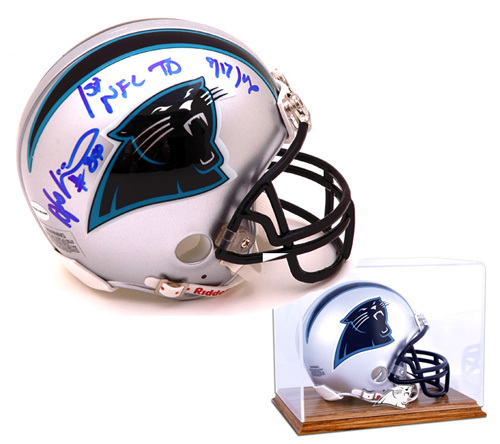 This Carolina Panthers Riddell Mini Helmet was Autographed and Inscribed by DeAngelo Williams (1st NFL TD 9/17/06). This Mini Helmet also includes an Oak Base Mini Helmet Display Case with Carolina Panthers logo. Includes certificate of authenticity. Autographed - Includes Mounted Memories certificate of authenticity. Carolina Panthers / Bank of America Stadium Framed and Matted NFL Panoramic Photograph. This officially licensed NFL panorama photo is of Bank of America Stadium in Charlotte, home of the Carolina Panthers, during a game (47 Yard Line) against the San Francisco 49ers. The deluxe panorama features black double matting and your choice of black or cherry frame, with a 1" x 4" engraved brass nameplate. Actual size is 40" x 14"